Spark your diwali with our dazzling diamond jewellery collection. 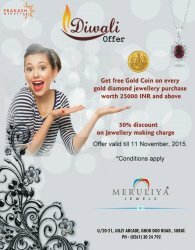 Meruliya Jewels gives discount offers on various diamond jewelry of rings, pendants, bracelets, necklaces, earrings and bangles. We also having diamond studded branded watches in all range. Offer valid till 11 November 2015, T & C Apply. Our store is located at U 20-21, Jolly Arcade, Ghoddod Road, Surat 395007.